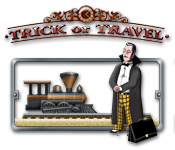 Trick or Travel is rated 2.7 out of 5 by 3. Rated 4 out of 5 by Ruckus777 from Addictive and Fun, Somehow When I first opened this game, I thought it would be horrible. After all, the graphics are basic and look like clipart. Plus, the music is somewhat repetitive, and some mechanics take a bit of getting used to. However, once I got into the groove of things, I was somehow hooked. The gameplay was fairly simple, just seat customers and get them what they want, yet there was a level of interest trying to find a place for them to sit and figure out who doesn't want to sit with who. (Plus if things got too stressful you could just exit out and go back in to exactly where you were, with nobody wanting anything anymore.) I was so inclined to give this a bad review based on the clipart-quality art and public domain sounds, but the game itself was fun. I liked that the levels flowed into each other, since it's apparently the same train ride every time. Overall, I liked it much more than I thought I would. Rated 2 out of 5 by SARA_BELLE from I wanted to give it a chance..... Very repetitious, no scenery changes, no dialogue..just got boring fast. Sorry guys. You are responsible for the train's timely arrival at the station. Catch happy smiles and make it to the station on time!